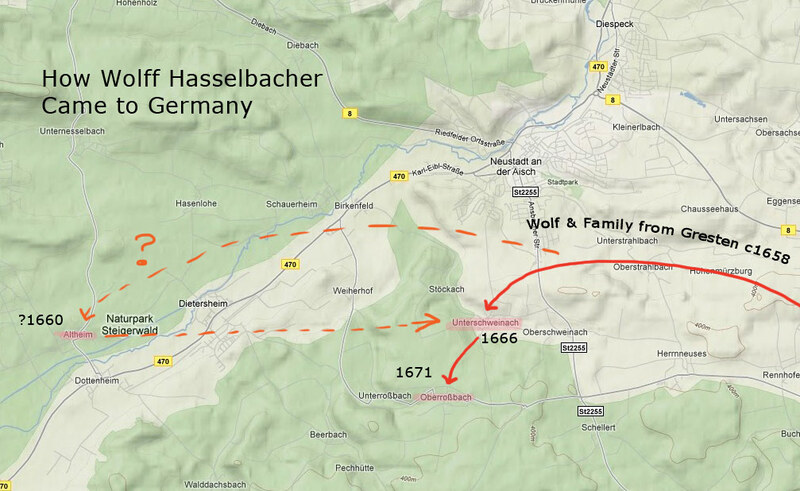 The historical authorities in the Aischgrund estimate that Wolff, his wife and two sons arrive in Germany about 1658 but I do not know the source of that information. It is clear that by 1666 the family is established in Unterschweinach but whether they settled there first is not known for sure. The reason for the uncertainty is that there is a record of Wolff being a communicant in Altheim in 1660. It is my understanding that there was a requirement to attend communion a certain number of times a year. Whether the family lived in or near Altheim or attended a church service there is unknown to me. Although there is a community house of worship in Unterschweinach today where services are held, I do not know how long it has been there. Altheim is about a 9 km walk from Unterschweinach– perhaps under 2 hours. Here are some photos of Altheim. In 1671 it is clear that following the death of Kunigunda, Wolff moves to live with the widow Agatha in Oberroßbach. In 1674 Wolff dies. I had in the past overemphasized the length of time that Wolff was associated with Oberroßbach. It occurs to me that I need to make an inventory of what churches were where in the 16 and 1700s.